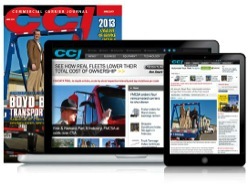 The issue of truck driver pay and industry retention of the drivers is the focus of a new three-part series at Commercial Carrier Journals. Reluctance: Fleets are reluctant to add capacity in a sporadic economic recovery. Let’s face facts: The last five years have not been great for the trucking industry as a whole. It’s been a prolonged period of stagnation on the economic recovery front. And moreover, driver pay won’t dramatically increase unless the trucking business costs lower or the industry as whole increases the volume of moving shipments. Under the current administration, it’s not an entirely promising outlook. But in the midst of these difficulties, Calhoun Truck Lines has increased our driver fleet 35% this year. Much of our firm’s success relates to allocating more resources towards driver retention and driver education. We spent more time training our drivers and using a variety of incentives to retain our fleet. Yes, the overall regulatory environment and an evolving intermodal sector is difficult to manage in the midst of these changes. But we feel that this environment can present many opportunities for drivers to succeed and stay close to home. If you’re a truck driver and interested in driving for one of the leading intermodal trucking firms in the Midwest, please contact us. We’d be happy to learn more about you and see if you’re ready to go trucking with us.